Sunshine Dizon (left) topbills Ika-6 Na Utos while The Greatest Love stars Sylvia Sanchez (right). Here are highlights of the comparative ratings of GMA-7 and ABS-CBN programs from January 28-February 3, 2017 from AGB Nielsen's Nationwide Urban Television Audience Measurement (NUTAM) ratings. GMA-7 is the overall winner of daytime and primetime on weekdays. Its shows regularly garnered higher ratings in its timeslots than its counterparts in ABS-CBN. Encantadia was the constant top-rater. The Kapuso fantasy series got the highest scores every night, even if it defeated ABS-CBN's FPJ's Ang Probinsyano by narrow margins. Two Kapuso shows, 24 Oras and Alyas Robin Hood, fought for third and fourth place. 24 Oras was still the country's chosen primetime newscast. It easily defeated ABS-CBN's TV Patrol, even by as high as 5.8 points. Alyas Robin Hood, a superhero action drama that stars Dingdong Dantes, was also victorious against My Dear Heart, a supernatural drama that stars Coney Reyes, Bela Padilla, Zanjoe Marudo, and child star Nayomi Reyes. Two other Kapuso primetime series performed well in their timeslots. The rom-com Meant to Be continued to attract a higher number of viewers than Bea Alonzo and Ian Veneracion's A Love to Last. In Meant To Be, Barbie Forteza is paired with Kapuso hunks Jak Roberto, Ivan Dorschner, Addy Raj, and Ken Chan. GMA-7's new Korean drama Pretty Woman, which premiered on January 30, defeated Pinoy Big Brother three times. GMA-7 was similarly as triumphant in weekday daytime. The biggest news was the live telecast of the Miss Universe pageant on both major networks on the morning of January 30. The Kapuso network won that round, when it got more than double the ratings of ABS-CBN's airing. The No. 1 show for weekday daytime was Ika-6 na Utos. 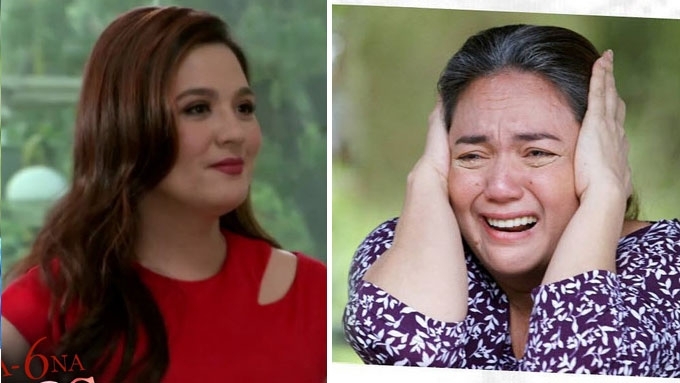 GMA-7’s infidelity drama gained ground during this period because Sunshine Dizon's character had started to fight back against Ryza Cenon's character who is the mistress. In fact, Ika-6 na Utos defeated It's Showtime by as high as 4.6 points. In the Top 10 ranking, Ika-6 na Utos was able to overtake Eat Bulaga as the highest-rated daytime program from February 1, 2, and 3. For years, the noontime show consistently held the No. 1 slot but this time, it was outperformed by an afternoon teleserye. In the previous ratings period, Ika-6 na Utos held either the No. 2, No. 3, or No. 4 spot among the Top 10 most-watched daytime programs. GMA-7's afternoon dramas were not as consistently strong. Hahamakin ang Lahat, which features the Kristoffer Martin-Joyce Ching tandem, lost a few episodes to Julia Montes's Doble Kara. The other drama is Pinulot Ka Lang sa Lupa, a new series that stars real-life couple Benjamin Alves and Julie Anne San Jose. The romantic drama premiered on Monday, January 30. Pinulot Ka Lang sa Lupa's pilot episode got an AGB rating of 11.4%, losing by a hair to The Greatest Love's 11.5%. Its next two episodes also lost to the heavy drama topbilled by Sylvia Sanchez on the Kapamilya network. Here are comparative ratings of GMA-7 and ABS-CBN programs from January 28-February 3, 2017 according to AGB Nielsen's Nationwide Urban Television Audience Measurement (NUTAM) ratings.